Have you seen Guardians of the Galaxy? It's Ben's current favorite movie and he's been begging to buy it from the day we saw it in theater. He was Groot for Halloween. 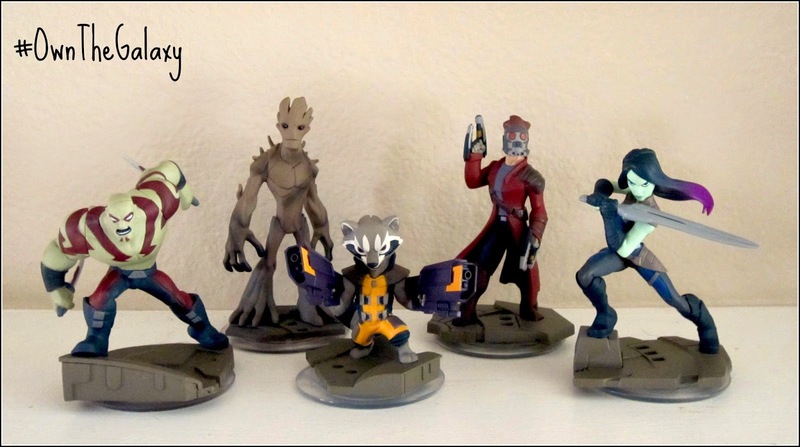 We preordered all the Guardians of the Galaxy characters for Disney Infinity 2.0. We even made him a special Groot sandwich! He's obsessed with Groot, Rocket Raccoon, Drax and the rest of the characters! 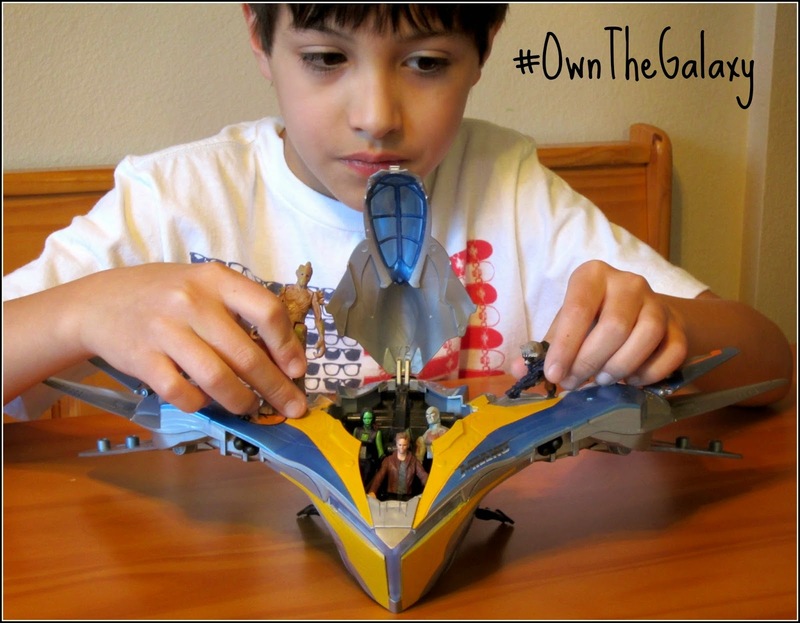 Yes, we kind of #OwnTheGalaxy already and we're having a little fun with #CollectiveBias checking out all the awesome Guardians releases, just in time for Christmas. Can I let you in on a little secret? I'm not a big superhero movie fan. Yes, Ben is totally disappointed in me, but even *I* loved this movie! The Guardians of the Galaxy soundtrack is completely awesome, how can you not love the songs on Star-Lord's Awesome Mix Volume 1? And really, the movie is funny and entertaining. It's rare we find a movie that all four of us like and Guardians of the Galaxy has been the first movie in ages that rendered 8 thumbs up (4 of us, 2 thumbs each, that's 8)! So, December 9th, we'll be off to our local Walmart and a copy of Guardians of the Galaxy will be making its way to our home. It would be a completely awesome stocking stuffer for Christmas, but that means waiting an extra 16 days and Ben has been talking about buying this movie since August. The DVD features an exclusive Character O-sleeve,exclusive music zinepack, a 64-page magazine with cast and crew interviews, exclusive behind-the-scenes photos and trivia PLUS a custom “cassette" laptop decal. You know what we are going to be doing on the night of December 9th, right? 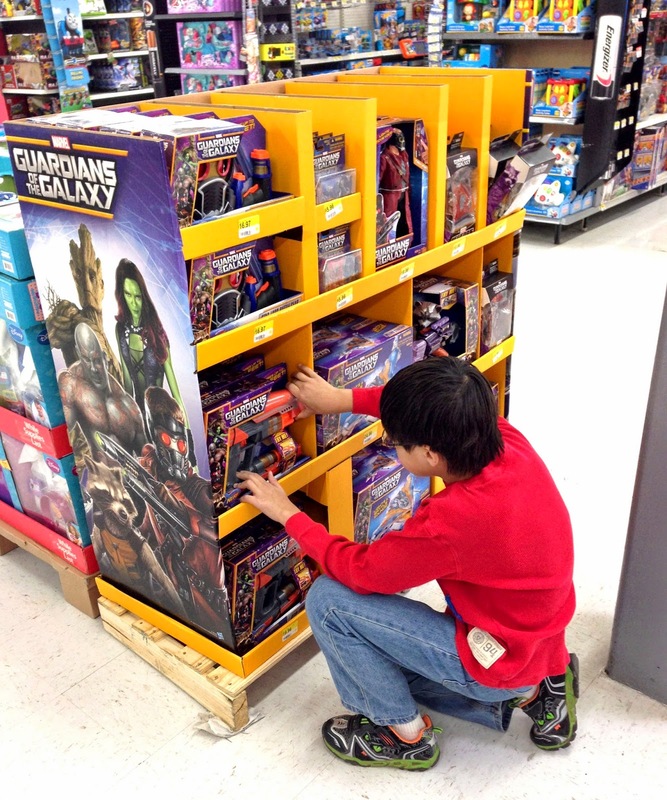 Since Ben is our in-house Guardians expert, he and I decided to check out the all the cool Guardians of the Galaxy toys, books and more at Walmart for his Christmas wish list. 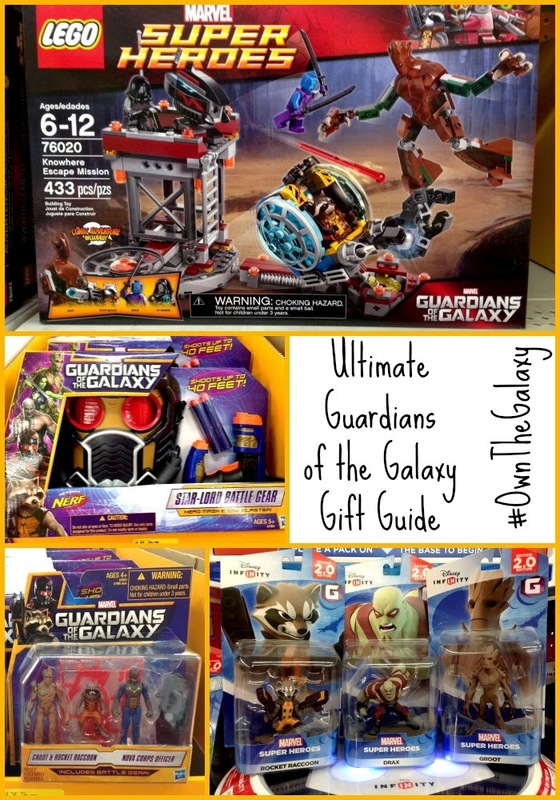 Need a few shopping tips for the Guardians-obsessed boy on your list? Ben was quite happy to share his favorites for the blog! At the top of Ben's recommended list are the Disney Infinity 2.0 figurines. Currently, there is a Star-Lord and Gamora two-pack, along with single figures of Rocket Raccoon, Drax and Groot. We own them already because I preordered them with our copy of the game back in August, but they are very high on the Ben-approved list! From 12/7 - 12/13, when you buy Rocket, Groot or Drax Disney Infinity 2.0 figures, you'll earn a $5 Walmart gift card. 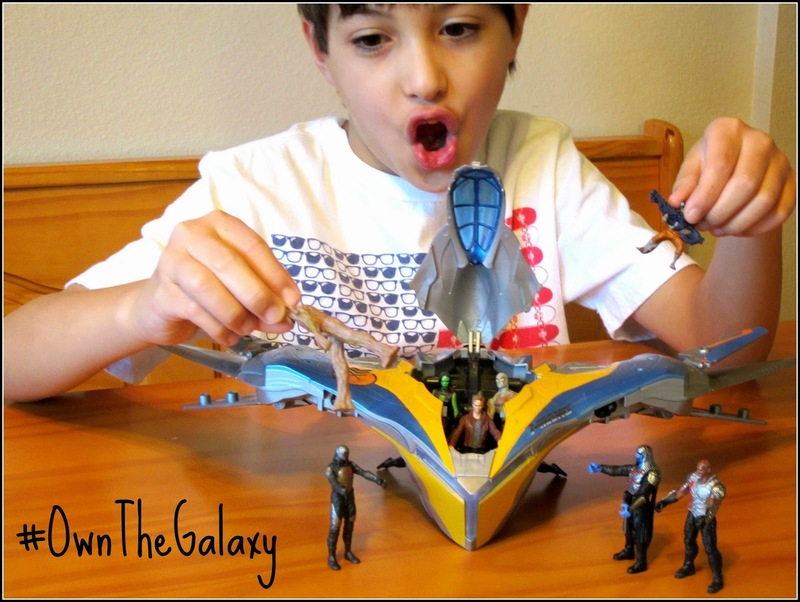 As part of our shop, Ben also had a little spending money to use, and he chose the Marvel Guardians of the Galaxy Milano Starship Vehicle with lights and battle sounds, along with several of the packs of figures that fit into the Milano Starship. And yes, a pack that included Groot was among the choices. Both my kids love miniature items and Groot stands maybe 2 inches high, perfect for Ben's imagination and pockets! Also on Ben's Christmas wish list, and not yet in my house, are the Lego Guardians of the Galaxy sets. We saw the Nowhere Escape Mission, Starblaster Showdown, and the Milano Starship that now feature prominently on Ben's list. We love Legos, so these are going to be an awesome addition to his collection. Ben also loved the idea of the Build a Figure figures. Confused? Each figure, besides Groot, comes with a part to build your own Groot! Once you have all the pieces to assemble Groot, you have the whole Guardians team. And something about building a Groot sounds awesome! Two more picks from Ben are the Star-Lord Battle Gear and Star-Lord Quad Blaster. These are made by Nerf and include Star-Lord's mask and weapons. Since we already had a Groot costume from Halloween, it seems quite reasonable that we need a Star-Lord costume too. Ben is also an avid reader and loved paging through the Guardians of the Galaxy book options. We found everything from simpler picture books to easy readers to junior novels to actual comic books. I plan to go back and get a few for his Christmas stocking. For the Guardians fan on your list, why not consider a copy of the movie along with one (or more, according to Ben) of the toys or books? Ben insists that it is *the* perfect gift this Christmas! Did you see Guardians of the Galaxy? What did you think of it? We would love to know, especially if, like me, you weren't quite a superhero or comic fan beforehand! We loved Guardians of the Galaxy as well! It was probably one of my favorite movies I saw in the theatre this year. I can't wait to share it with our boys! Thanks for the tips on the great toys out there! The hubby saw it said it was really good. I plan on letting the kiddos watch it soon. I am a super hero fan so I am sure I will like it too! We loved this movie, and we got the Knowhere Escape lego set. It is so detailed, and really fun - I bet Ben would love it!